For this exercise I mostly called upon my own experience. By that I mean what spaces do I use and how do I use them. To show spaces in a way that gives a sense of how the space is used I looked at magazines and newspapers, particularly the home and decorating sections. Advertisers are better skilled than me at knowing what will tempt someone to buy a product, in these sections of publications the advertiser is attempting to make you feel it is you in the place or using the product they are selling. 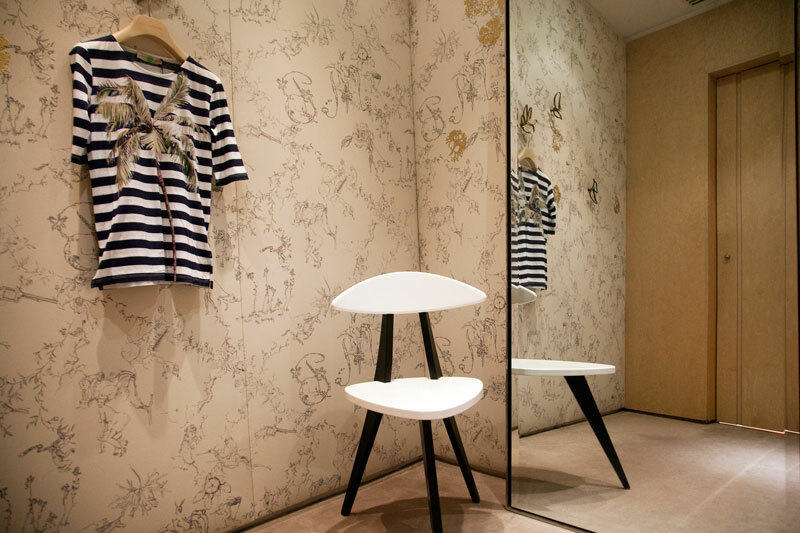 My first image is a changing room in a department store. I sought out one that the door locked, had a full length mirror, plenty of hooks, so you have somewhere to hang the clothes you take off as well as the ones you are trying on. A chair for me to put my bag on. This is a woman's ideal changing room. Not one of those tiny spaces with a flimsy curtain thanks very much. To give the feeling of size of the changing room I used the widest angle I have, 24mm. I would have liked an ever wider angle say about 17mm to make the room feel very big. I've crouched at an angle that gives a sense of walking into the room and for most of us women our first reaction would be: 'perfect, privacy and space'. I've used the mirror to add to the sense of space and to show that it is a real door, not a curtain. My next image is in a bookshop. 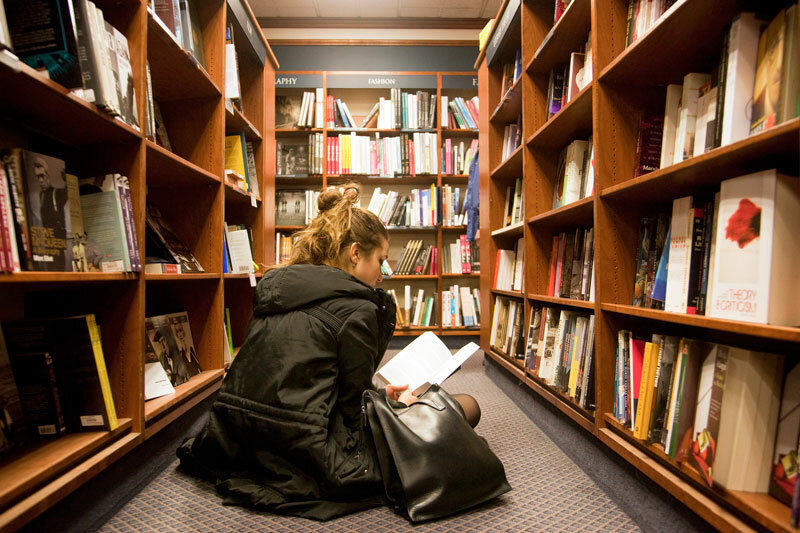 To me the perfect book store has loads of books (obviously) quiet spaces and the staff don't mind if you sit for ages looking through books. The woman on the floor uses a book store the same way I do. I saw her and immediately saw the shot. Fortunately she was willing to allow me to include her in my picture. I took this picture sitting on the floor to make the viewer feel they are also sitting reading on the floor. If I had taken the picture standing looking down the feeling would be more of the passer by as opposed to the user. I've shot at 28mm to try and encompass as much of the surrounding books as possible. As it is very dark in here and flash not possible, I have increased the ISO to 1600. To show I don't spend all my time in stores I decided an outdoor space would complete my set of three. As part of the photography I have been doing around Kings Cross regeneration I have been working with an organisation Global Generation. "We are dedicated to giving young people opportunities to play a part in creating a sustainable future. Global Generation supports young people to generate change. We focus our projects on the three interdependent themes of ‘I, We and The Planet’. This approach increases awareness of self, community and the natural environment and instils young people with the confidence to generate change in the business and local community." It is an inspiring project mentoring young people to become actively involved in their community, in decision making and thinking about the future of themselves and their environment. Equally the businesses that have become involved is making a difference. I've photographed construction workers sharing their skills to help get the skip garden up and running. Together they have built their own learning space. Created gardens and the young people have sold the produce to local restaurants. Gardens and beehives have been installed on the rooftops of businesses in the area. I've seen a basketball court and garden created on the roof of a school as a joint project with local business. 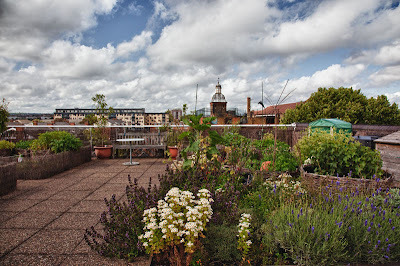 For my final image I wanted to show a rooftop garden from one of the on-going projects. I want the viewer to feel they are standing in the garden and looking out over Kings Cross and can feel some of the pride that the creaters feel.